Well I used primary colors (Distress stamp pads) to stamp the Gothic alphabet (Quietfire Design) and love the look it created... And what says school more than an apple... so this card will be for quite a few challenges. Wrote in my "Sentiment" with a funky lettering and a Micron pen. 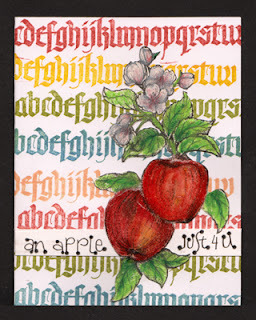 Stamped the apple sprig (Flourishes "Apple of my Eye" set #SS129) with Versafine Black Onyx on some cream toned cardstock, colored with Prisma colors, cut out, adhered to card and added Glossy Accents to the apples. Voila - all done. Woodware US Clear Stamps #40 Try a new technique. What a great card Yogi!! Thanks for joining us this week at Penny's. Good Luck! Super cute card!! Love those apple stamps. This is so pretty! Love the alphabet! Thanks for joining us at Penny's! Fab Design! Love that letters in the background and the bright colours! Thanks so much for joining us at Creative Stamp Friends this time! Great card! Your coloring of the apples is gorgeous! Thanks for playing along with us at Your Next Stamp! This is a beautiful card. I love the image and colors. Thank you for sharing and joining us at Penny's Challenges. Good Luck.